Carolyn Hibberd reports: “The ICA annual fixture against Ardrossan Castle Curling Club took place on Wednesday 1st April at the Greenacres Rink. The Irish Ladies Team had arrived at Greenacres earlier in the day for training and were pleased to play a game together in the match. After a shaky start the girls played a solid second half to finish a close 7-10 down to a strong Ardrossan Castle team, skipped by Frazer Erskine. Thanks to KT Kerr, Hazel Gormley-Leahy, Alison Fyfe and Ailsa Anderson. The second match was against the “weel kent” Ardrossan Castle team skipped by Gordon Christie. The Irish four were Carolyn (lead and skip), Margarita and Alan with Arran playing last stones. This format worked pretty well for most of the time and the game was very close until the last two ends. Unfortunately the final score was a loss by 5-10. This International is always a fun evening with the games being played in the true spirit of of bonspiel curling. Thanks to our players for taking part and to JJ and Martin for their support of the Ladies Team and to Liz Knox also for being our cheerleader! 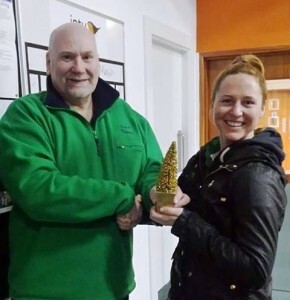 One trophy going further afield was the ‘ICA Glittertree’ which was presented to our California girl Katie Kerr by Johnjo Kenny after her stunning Christmas tree won the Chistmas tree challenge for 2014. Katie also won some tasty Tayto crisps, and thanks go to Peter Wilson who brought them over with him last weekend, but they seem to have gone missing before they could be presented to her! Johnjo presents Katie with the ICA Glittertree. But who ate all the crisps?